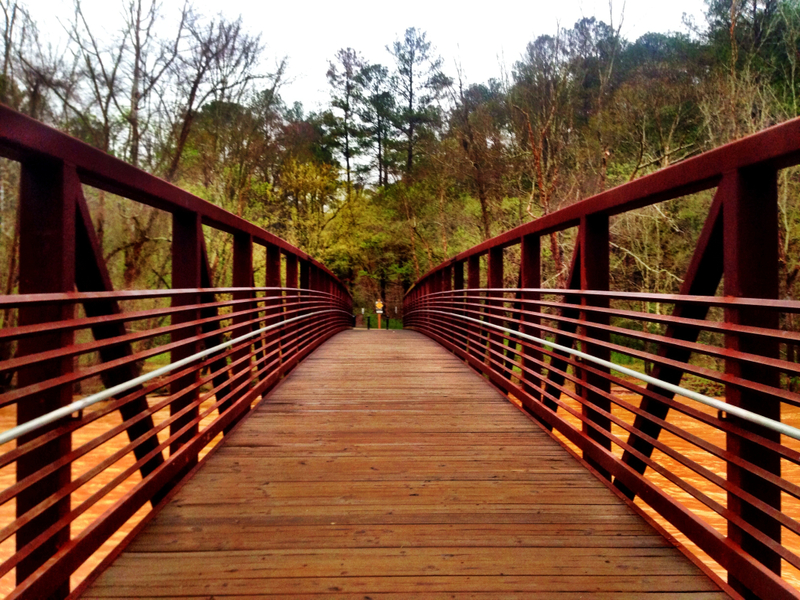 Olde Rope Mill Park has some great mountain biking trails that are tucked away in a wooded area on the outskirts of Metro Atlanta. 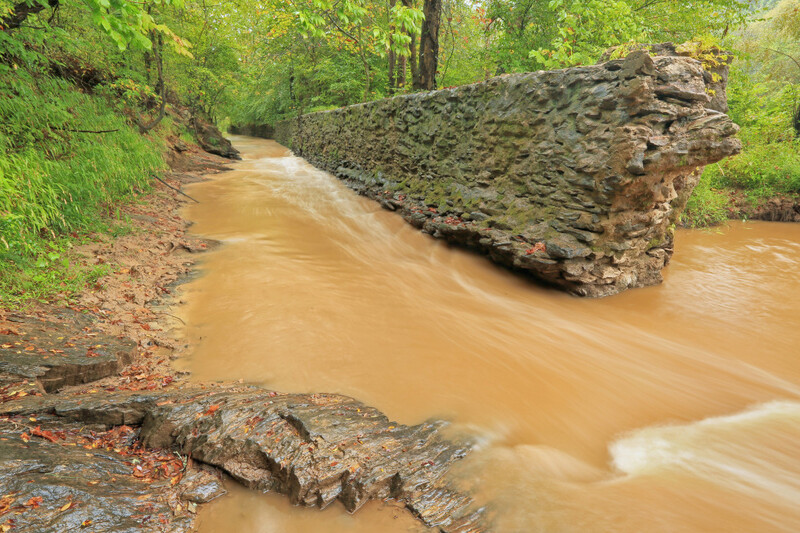 Little River runs through the park, and although most trails do not run right alongside it, you can view it from several points on the trails, and it provides a very relaxing spot after your ride. It also has a paved area, which is great for a cool down, beginners, and for families. The Taylor Randahl Memorial Bike Trails at Olde Rope Mill Park are great places for both beginners and advanced riders alike. The SORBA maintained trail system is stacked-loop layout, consisting of two trails with a total of six loops. 15 miles of trail vary from beginner to advanced. Little River runs through the park, and on peaceful mornings you can hear the bubbling of the water. In warm months, it's easy to detour to the banks for a dip in the river. The trails are a mix of packed dirt, mud, clay and sand, and a few dips slosh through the creeks that offshoot from Little River. Deciduous trees tower over the trails and provide ample shade- a welcomed relief on a hot day. The Explorer Trails are located northwest of the parking lot, and they are accessed by going up the dirt road on the nearby hill. You'll see a fence, which was placed there to prevent motor vehicles from entering the area. Go around the fence to begin your journey. This section is very heavily wooded and peaceful, and consists of three loops. The Explorer Trail Loop 1 (.5 miles) is a nice, smooth opener, great for warming up. This wide, smooth singletrack is also great practice for those who are just getting into the sport. This is the only beginner rated trail in the park. The Explorer Trail Loop 2 (1.5 miles) is slightly more technical, featuring switchbacks, some steep climbs, and rougher tread (more rocks and roots to mind). You will gain lots of speed on the downhill runs in this track, requiring you to approach the corners with caution, especially if you're new to the area or the sport itself. This trail, like the rest in the area, is rated as intermediate. Beautiful views of the Little River basin can be seen on this loop, making it very worth the ride. The Explorer Trail Loop 3 (1 mile) is SORBA’s newest addition that can be accessed by crossing the bridge. More experienced riders will love the Avalanche Trail loops, which have steep ups and downs and a narrower, more technical single track layout. Avalanche Trail Loop 1 (1.5 miles) is a highly wooded trail that consists of lots of short but steep ups and downs, switchbacks, rough tread (abundant rocks and roots). On the Avalanche Trail Loop 2 (2.25 miles), you will continue to see lots of switchbacks, steep ups and downs, and narrow passes, as well as a challenging boulder crossing that offers gorgeous views of Little River down below. The Avalanche Trail Loop 3 (2.5 miles) is the most serene ride out of the three Avalanche trails; the tread is much smoother, the track is more linear, and it has a nice flow to it. This is also a great trail to warm up on for more experienced riders. Leading off the right of the parking lot, and running alongside Little River is a very wide, paved, flat trail where you'll find many runners and dog walkers. This is a great trail for beginners, or those who just want a peaceful ride after conquering the more technical trails in the area, complete with scenic views of the river the entire way. Riders who want a fun day out with lops for loop / lap options. There are no parking fees in this area. The parking lot is not very sizable and can fill up quickly during peak times (afternoons and weekends). There are no facilities provided here, so you may want to stop by a bathroom before you begin your journey. There is a pavilion, benches and even swings by the parking lot as well, if you want to relax by the river for a bit after your ride. The area is quite pretty, and fun to explore on foot as well. Please note that the area is open to trail runners and hikers as well, but they must travel in the opposite direction of the bikes. Mountain bikers always have the right of way, but it is a good thing to be mindful of the pedestrians when coming around sharp corners to avoid a collision. Many sightings of snakes have been seen here by the river, so keep your eyes peeled. The trail directions Sunday, Monday, Wednesday and Friday are clockwise to the left. The trail directions Tuesday, Thursday and Saturday are counter-clockwise to the right.